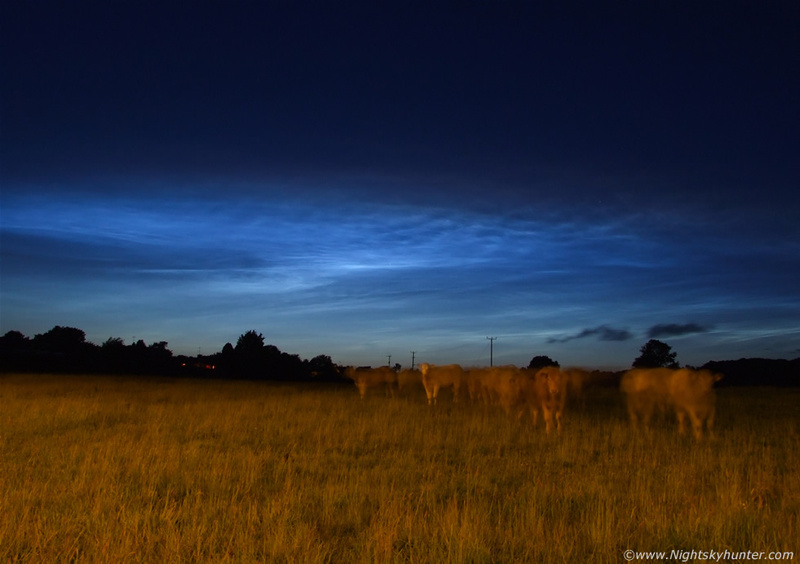 Noctilucent Clouds and cows outside Maghera on June 17th/18th 2009. These Cows were not shy and their curious nature over powered any fear they may have had, they were friendly Cows and eventually walked over to me and began sniffing the tripod and rubbing their noses against the metal legs, I had to detach the camera at one stage in case it got knocked over or covered in Cow breath. They then surrounded me and blocked my view of the NLCs for a period so I had to walk to another sector of the field then they would follow me once again, this strange pantomime continued. * All images are available for sale in the form of photo prints, canvas or digital files for licensing, if you are interested in a purchase simply drop me an email.